The Journey documentary - "Don't Stop Believin': Everyman's Journey" – will be released On Demand and Digital on March 9th. The film will open March 8th in select US cities, a complete list of theatres screening the movie can be found at EveryMansJourney.com. The documentary tells the story of how the classic rock band Journey found singer Arnel Pineda online and brought him into the group. In 2007, Arnel's friend began uploading videos of the aspiring Filipino singer covering classic rock songs onto YouTube. One of them was seen by Journey guitarist Neal Schon. Blown away by Pineda's talent and uncanny vocal similarity to former Journey front man Steve Perry, Neal flew Arnel from Manila to San Francisco to audition for the band, and the rest is history. But Arnel's personal journey had just begun. Having lived life on the street since age 13 with no classical music training, he was anything but prepared for the grueling physical and emotional strains that come from fronting a rock band on a whirlwind world tour. Can a man who has already overcome so many obstacles deal with the demands of his newfound fame? 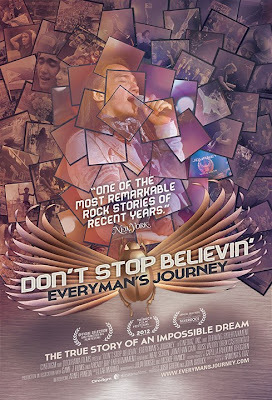 A rare behind-the-scenes look at one of America's most beloved rock groups, "Don't Stop Believin'" takes a trip around the world with band members and fans alike, watching as the newest Journeyman converts skeptics and haters into adoring fans—and breathes new life into Journey for the next generation of international listeners.